Photolalia: The Indecisive Moment -- Some images... and a few brief words about them. Fruitvale Rail Bridge from Park Street Bridge, Oakland Estuary, Summer 2007, during the fires. I can't believe I almost didn't bother taking this shot. I live and work (and have my studio) maybe half a mile from where it was taken, and I was walking across the Park Street bridge into Alameda to get some breakfast when I saw it. For several days the light had had an eerie copper tinge due to the brush fires running wild in some of the hills and mountains surrounding the Bay, and that morning everything was reduced to this beautiful near-monochrome (and everything smelled of smoke). 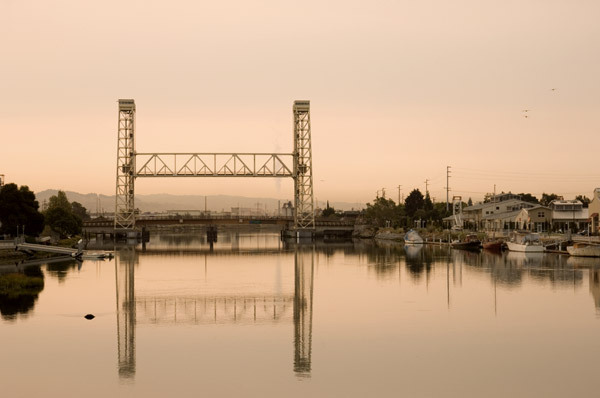 The Fruitvale Rail Bridge just stands there semi-abandoned, always open, but still a workaday structure next to the smaller (and very much alive) Fruitvale road bridge (like the Park Street Bridge a drawbridge). The smooth morning water really made this view work that day, allowing for the bridge reflection as well as the the overall tone. A great sight. But, unusually for me, I didn't have my camera with me, and I decided I just couldn't be bothered to go back and get it (translation: I'm not really much of a photographer a lot of the time). I was hungry and tired. But by the time I'd walked across the Park Street bridge into Alameda, I felt really guilty about just walking on by a sight like this. So I turned around and started back across the bridge to pick up my camera. About ten metres onto the bridge I had another change of heart, thought (again) that I really just didn't want to walk back to get the camera (I just wanted a bagel and some coffee, dammit), and headed back into Alameda. You know the rest: a few seconds later, once again, I turned back, trudged home, picked up the camera, and spent an hour or so taking photos all around my neighbourhood in the strange alluring light. This was one of the best. It's entirely unmanipulated beyond flattening the contrast a little.